From 3 to 5 – Epic Riding. Epic Writing. Grizzly Adam welcomes his twins into the world. Do you call this laid bakfiets style? 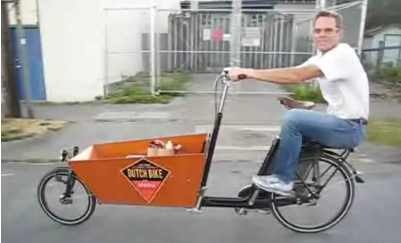 Funny video of a guy riding his bakfiets bike while sitting on its rear rack. Nice overview article covering the evolution of bottom brackets from cotterless/square taper to outboard ceramic bearing. I think square taper bottom brackets are still more than adequate for the kinds of demands I put on my bikes, but outboard bearings seems to be the direction the industry is headed. Tour divide racer, Felix Wong’s post ride slideshow featuring a picture for each day until completion. Awesome bicyling illusion poster. The only thing I don't like about autumn bicycling is that snow follows all too quickly. Kona suspension bike that automatically stiffens the tail for climbs and then softens up the ride again for downhills. Helpful guide to setting up and using a gps to navigate a given route while bike riding. Could be very useful on a long brevet. 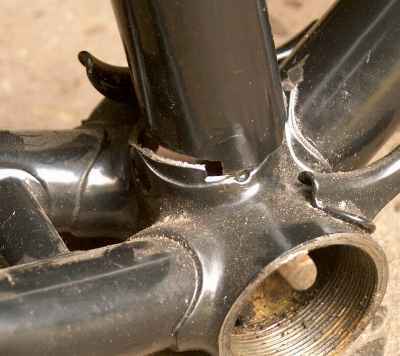 Cool series of photographs of bicycle parts and frames on the verge of failure.